Connecticut’s Department of Energy and Environmental Protection (DEEP) and the Connecticut Agricultural Experiment Station (CAES) report that a heavy population of the lone star tick, Amblyomma americanum, has been detected at Manresa Island (former Norwalk Harbor Station) in South Norwalk, Connecticut, marking the first known established reproducing population in the State. The geographic range of this southeastern tick species has been slowly moving northward, becoming established on eastern Long Island, NY in the 1990s. There has been a steady increase in submissions of lone star ticks to the CAES Tick Testing Laboratory, but the numbers have remained small, around 70-90 in recent years and only 2-3% of all tick submissions. The majority of lone star tick submissions are from lower Fairfield County. The tick has been very rarely collected by CAES in various tick research activities. The presence of the lone star tick population in South Norwalk first came to light as a result of a June, 2017, report from a South Norwalk resident about a deer that was acting strange. When DEEP Environmental Conservation (EnCon) Officer Jesse Nivolo arrived on scene at Manresa Island, the animal was deceased. But, Officer Nivolo found the animal had suffered from a severe infestation of ticks, which still completely covered its eyes, ears, head, and neck. Photos from Officer Nivolo made their way to the CAES, which led State Entomologist and tick researcher Dr. Kirby Stafford to examine the animal and determine that it was covered by lone star ticks. “The number of ticks on and around the animal was incredible” noted Dr. Stafford, “a population of this size has been established, unreported for many years”. Subsequent sampling of the area by CAES researchers in July confirmed that the lone star tick was incredibly abundant at the site, but did not appear to be established elsewhere on the mainland. High tick densities appear confined to the Manresa Island site. The site is not open to the public and poses little direct threat to residents. However, the Norwalk Health Department has noted that lone star ticks were increasingly being submitted from local residents suggesting that ticks were being introduced to other areas in the town. The tick can be acquired by people beyond its established range as migrating birds can carry larvae and nymphs northward, where they drop off, molt to the next stage, and then seek a host. Other residents may pick up lone star ticks while visiting or vacationing on Long Island or areas further south. 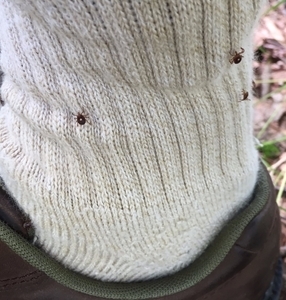 The lone star tick is the most common human biting tick in the southeastern United States with roughly 90-95% or more of the ticks either collected from vegetation or reported attached to humans being A. americanum. This tick is widely distributed through the southeastern United States as far west as mid-Texas and north to southern parts of Iowa, Illinois, Indiana, Ohio, Pennsylvania, and Wisconsin. Along the Atlantic coast, its northern range extends to the middle and southern half of New Jersey and Long Island, New York. It is also abundant on Prudence Island, RI and recently appears to have become established on parts of Cape Cod, MA. Their northern range may be increasing due, in part, to the milder winters the northeast has been experiencing over the past few years. Drs. Stafford and Scott Williams at CAES have found that the lone star tick can overwinter in Connecticut. Lone star ticks are reddish brown in color. The tick gets its name from a conspicuous spot on the back of female ticks. Male ticks have faint white markings at the edge of the body. All stages are active during the summer months, but adult tick activity peaks in the spring and early summer, while nymphs are active from April throughout the summer. Larval ticks are most abundant in the late summer and early fall. Female ticks can lay 1,000 to 8,000 eggs with an average of around 3,000 eggs, so populations can build to tremendous numbers under suitable conditions. In some areas in the southeast where this tick has long been established, 80-100% of white-tailed deer can be infested with tick burdens exceeding 300 ticks per deer. Heavy infestations have been known to kill fawns and young animals. Long considered primarily a noxious pest, the lone star tick is associated with a number of human and animal diseases such as ehrlichiosis, Southern tick-associated rash illness (STARI), spotted fever rickettsiosis, tularemia, Heartland virus, theileriosis in deer (related to human babesiosis), and more recently, red meat allergy. Bites from lone star ticks may produce or generate a hypersensitivity allergic response that causes a food allergy to a red meat protein called alpha-gal that is found in most mammals, but not humans or other primates. Lone star ticks do NOT transmit the pathogens that cause Lyme disease, babesiosis or anaplasmosis, which are transmitted by the blacklegged tick, Ixodes scapularis.